Giant anteaters are usually found in tropical and deciduous forests as well as the grasslands of Central and South America. They do not have any teeth but have a tongue which is more than 60cm in length and a tiny 1.25mm wide which they put to good use by eating over 30000 insects per day! 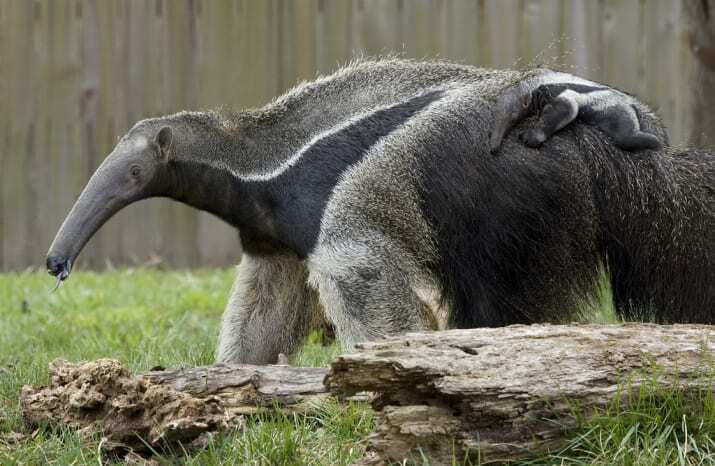 Did you know that giant anteaters are Category One dangerous wild animals? That means they are classified as being as dangerous as lions, tigers, bears and hippos! HI We really enjoyed our visit to Longleat a week ago today. We did a bus tour and Dave was great. There re a couple of animals I would appreciate your help in identifying – I took their photos but they are not in the book I bought: (1) The animal who lives with the Giant Ant Eater and (2) the bird who lives with the butterflies. Thanks! We have checked with Longleat for you and they are happy to confirm that the animals in with the giant anteaters are ‘maras’, which are a member of the rodent family and most closely related to Guinea pigs. The bird in the Butterfly house was a ‘red-crested turaco’ named Ronnie, who has recently set off to a different collection in the hopes of finding his forever-mate, as they are a monogamous species.